Not convinced by the necessity of low capacity solid-state storage? Then YOYOTech's latest Fi7epower machine might well be the right rig for you. Like the Vibox Boss XS, it has thrown its full weight behind the performance of the processor and graphics card, rather than the more ephemeral positives of running the machine from an SSD boot drive. With the Core i7-3770K, arguably the finest processor that Intel has made in recent memory, doing all the raw processing shenanigans at the heart of the budget-oriented Asus motherboard it's right up there at the top of the CPU performance tree. It's not the quickest due to a slightly speedier overclock from Vibox, but at 4.5GHz compared to the 4.6GHz of the Boss XS, it's a close run thing, and still makes the Fi7epower a lot quicker than the competing i5-based rigs. 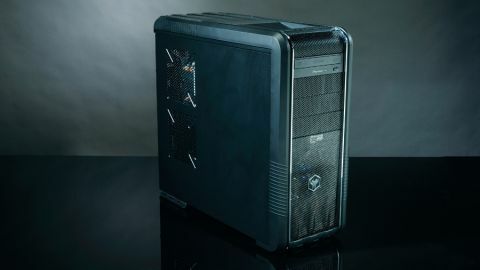 It's not just the top Intel CPU that's churning away in the Cooler Master 690 chassis - the graphics card is pretty quick too. YOYOTech has opted for the top of Nvidia's desktop range of Kepler cards, the GTX 680. Like the Vibox GPU it's just the stock-clocked version, so there is a little in the way of extra pace available if you want to try the overclocking dance yourself. That said, the overclocked GTX 670 that's responsible for the graphical grunt work for the Chillblast machine gives practically the same benchmark scores across the board, and saving some cash on the GPU would have meant it could have added a small caching SSD to speed up that Western Digital hard drive. But that hard drive isn't quite the limiting factor that it was with the Boss XS. It's a full SATA 6Gbps drive, and that means it boots in half the time of the slower SATA 3Gbps Seagate drive used in the Vibox machine. If YOYOTech could trade the GTX 680 for a GTX 670 and a 60GB SSD, the Smart Response caching tech - conspicuous by its absence from the Dino PC build - would be available to knock that boot time right down again. The AdvanceTec rig shows just how quick a cached HDD can be on boot, ably keeping pace with the speedy SSDs used by the bulk of the other rigs in this group test. Having that eight-threaded monster of a CPU inside the machine means that it will cope with anything computing related you throw at it. If you split your time between gaming and anything productivity related, you'll be glad of those extra threads. There is a simple, short upgrade path too. Simply adding in a decent capacity SSD will give you a really top-notch rig, and with prices crashing in the solid-state market it's cheaper than ever to do so. Replacing a CPU or GPU is going to be a lot pricier. It's the faster HDD and more stylish, if last generation (there are no front-mounted USB 3.0 ports, for example) CM 690 chassis that give the Fi7epower the edge over the similarly specced Vibox machine. They both have a rather paltry one-year return-to-base warranty, though the lack of a solid state drive here isn't the killer you might think it would be.